The 2015 bear season is not quite over. 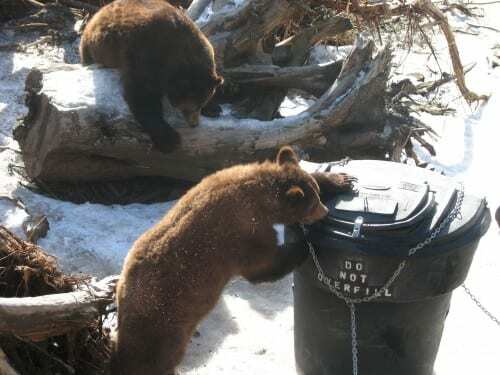 The Sitka Police Department has received several recent reports of bear sightings around town — on the SeaMountain Golf Course and near Indian River Road. State Fish & Game biologist Phil Mooney says that bear sightings every month of the year–even in December — are not uncommon. And although bears enter dens in the winter, they don’t necessarily sleep all the time. Mooney says the teen bears frequent Sitka because it’s safer than moving out into the established homeranges of older bears.. Sitkans should not let their guard down, he says, especially if they’re out walking early in the dark. And they should always be prepared to see bears in the area, chomping on cohos and deer gut piles. Mooney says residents need to stay on top of their trash and be mindful of what they’re putting out. “Even though it’s colder temperatures and the scent doesn’t carry as far if the bear finds it and it’s food he’s going to come back to it,” Mooney said. He says walking in groups and carrying bear spray are good practices in Sitka, even in winter.